In celebration of National Public Telecommunicator’s Week (April 14-20, 2019), the Post Falls Police Department would like to recognize the Emergency Communications Officers (ECO’s) for all they do. 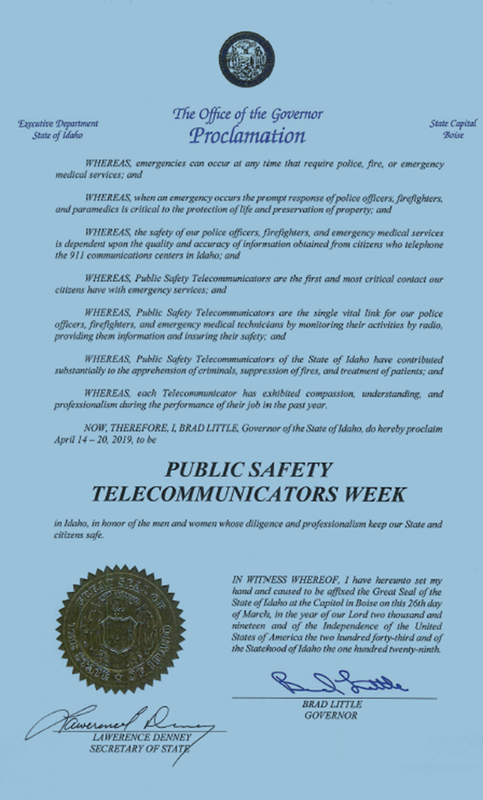 Each year, a week in April is dedicated to the men and women who serve as Public Safety Telecommunicators (dispatchers). Whether it is a citizen calling the police to report an accident or an alarm company notifying police of a commercial alarm, the police department’s communications center handles thousands of calls for assistance each year. The communications officers are the lifeline for the community and for our patrol officers. They are the true first responders. Duties of a communications officer are broad. In addition to performing a variety of clerical and administrative tasks, the communications officer’s primary responsibilities revolve around receiving information from the public and other law enforcement agencies concerning various emergency and non-emergency situations, and providing the information to the appropriate responding units. At times, the job of the communications officer becomes very stressful. On many occasions, a call is received from someone in a crisis situation in need of police, fire, or EMS assistance. The communications officer must be able to calm the caller so the necessary information can be obtained. The Communications officer must then effectively relay the information to responding units and agencies. The safety of police officers involved in emergency situations often falls on the shoulders of the communications officer. They are a patrol officer’s link to assistance while on the scene of a crime, disturbance, or accident. The communications officers play a vital role in the department’s ability to serve the citizens of our community. With their skills and dedication to duty, the department is able to fulfill its obligations to the citizens. It takes a special type of person to be a communications officer. He/she must be alert, level-headed, and above all quick-thinking. THANK YOU to all of our Emergency Communications Officers: Amanda Hughes, Hillory Wichman, Nicole Leslie, Julie Oppedyk, Curtis Lybeer, Jennifer House, Alyssa Tuntland, Kapu Smith, Jordyn Odegaard, Catherine Horton, Aleana Compton, Denise Wooldridge, Haley Schelin, and Supervisors Michaela Thompson and Lori Flood. Each of you is an indispensable link between the patrol officers and the public. You should be commended for your dedication and professionalism. The reputation and image that our department enjoys is due in large part to the excellent manner in which you have performed your duties. I am proud of each of you and the work that you accomplish daily! Our Emergency Communications Officers (ECOs/Dispatchers) do a fantastic job!